For information on how to access forms to apply for the tax credits click here. Below are a list of Plug In Hybrid Electric Vehicle (PHEV) models and Battery Electric Vehicle (BEV) models that are currently available on the market. Click on the image below to enlarge. For more information on cost savings visit the DENC Cost Comparison Calculator. 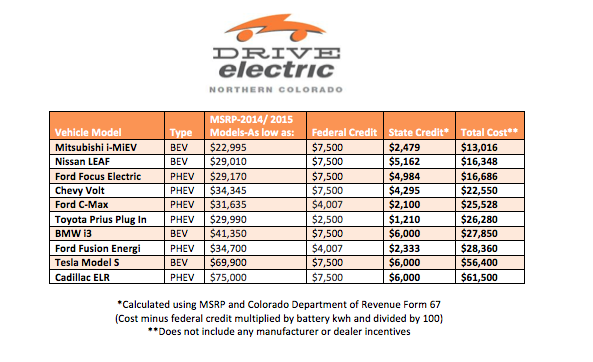 Most plug-in electric vehicles are eligible for federal and state tax credits. The federal government offers a tax credit of between $2,500 and $7,500 for vehicles with batteries of at least 4kWh capacity. Both the Nissan Leaf and Chevy Volt are eligible for the maximum tax credit. The Department of Energy and the Environmental Protection Agency update the list of eligible vehicles and the value of the credit for each eligible vehicle every year. Taxpayers must have tax liability equal to or greater than the credit to be eligible. The tax credit cannot be used at the time of purchase, but does reduce the taxpayer’s tax owed dollar-for-dollar. The state of Colorado also offers a tax credit for the purchase of alternative fuel vehicles, including plug-in electric vehicles. The value of the credit depends on the technology employed and the vehicle’s emissions profile, and has a maximum limit of $6,000. The Colorado Department of Revenue, Taxpayer Service Division, publishes a schedule every year for each vehicle model. Similar to the federal credit, the state credit cannot be monetized by the vehicle buyer at the point of sale. It is, however, refundable, meaning that if the value of the credit exceeds the vehicle purchaser’s state tax liability, the state will refund to the taxpayer the portion of the credit that exceeds the purchaser’s tax liability.